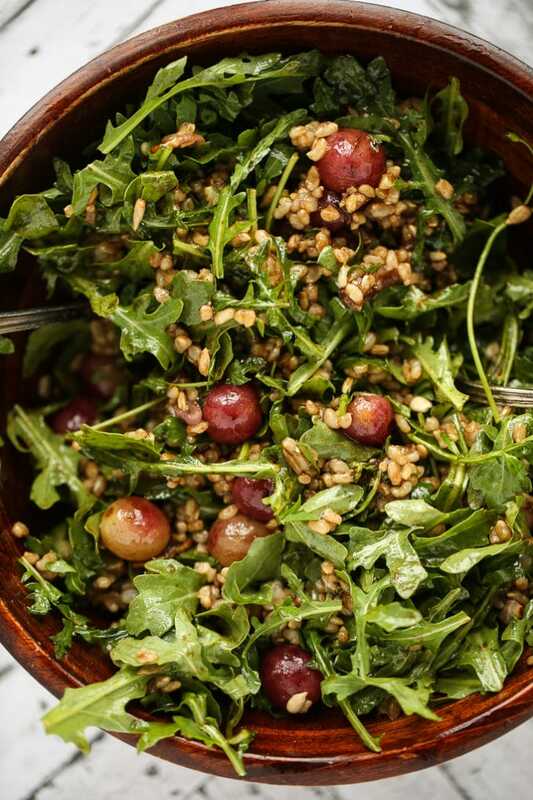 This vegan arugula, brown rice & roasted grape salad is satisfying in an almost indescribable way. 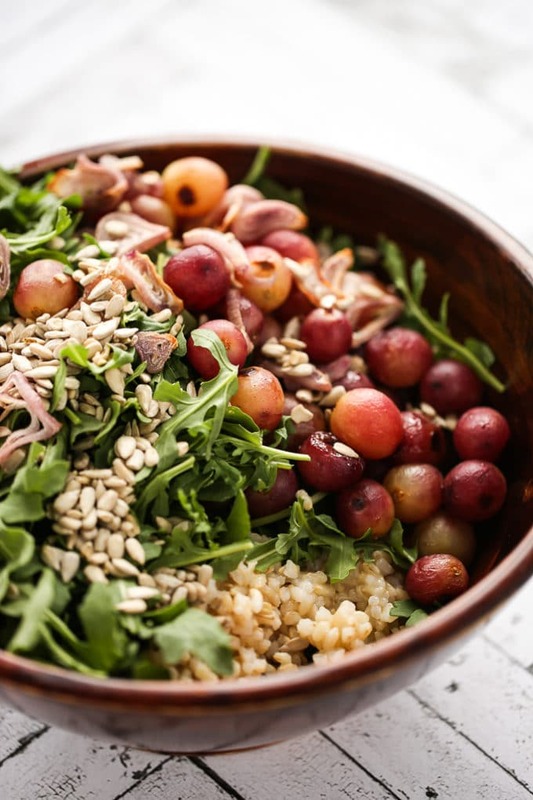 Something about the savory nuttiness of the toasted sunflower seeds paired with the juicy sweetness of roasted grapes and the peppery bite of arugula, sends my tastebuds sailing. Lately, I’ve been catching myself wishing for a few more hours in the day, another day in the week, and another week in the month. Hell, I’d probably take another month in the year if it had a swanky name and extended the rare “sweet spot” in Chicago’s weather pattern. You know, that ever elusive span of sunny, 75-degree days that appears randomly and without warning sometime between March and November? Yeah, that one. I’ll take a little more of that, please. 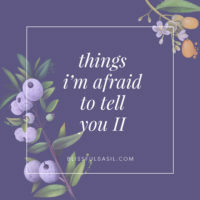 Early last week, I was caught in a particularly nagging cycle of wishing for more time/feeling like I wanted to run and hide from a growing list of to-do’s. By the time Wednesday afternoon rolled around, the to-do’s that I typically classify as benign when I have the time to greet them one-by-one, banned together to form an army of bossy drill sergeants. And I felt weighed down and outnumbered. Not in a utterly overwhelmed kind of way but in a make-it-stop/does-this-list-ever-end (and can-someone-else-PLEASE-do-my-laundry) kind of way. Caught in a tailspin of I need to X, Y, and Z, I hopped in my car after work, hurriedly jabbed my finger at the play button on a random episode of this podcast series (it’s an awesome series, btw) and set out to chisel away at a tall mountain of to-do’s with a dull pencil attitude. It turns out that the universe felt like dishing out a little love (and a splash of irony), because the podcast episode I randomly and frustratedly poked — out of nearly 100 episodes, I should note — was episode #87: “How to Change Negative Thought Patterns & Understand the Ego with Brooke Castillo”. 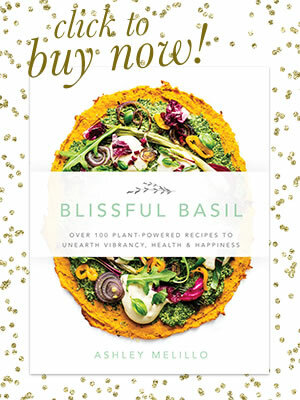 Even more meaningful than the title itself was when Brooke (the interviewee) suggested a single and powerful shift in self-talk: swapping “I need/have to…” for “I want to…” when approaching tasks, chores, projects, and to-do’s. Do you ever feel so struck by something in a podcast that you find yourself nodding and grinning excessively while sitting alone in your car at a stoplight? I’ll tell you what, that podcast and I had a moment there. A mutual understanding of sorts. But in all seriousness, “I need to…” is a phrase that flickers throughout our internal dialogue on a near constant basis, and it’s the worst kind of thief. It steals precious moments from our free time, our sleep, and even our working hours. And what does it offer in return for listening to its ceaseless demands? A nasty old bucket of stress and guilt. Whadda jerk. Replacing “I need to…” with “I want to…” gives our minds the opportunity to recognize a dreaded or blasé task as a choice or even a privilege rather than a demand. This small and impactful shift returns the power to our heart by reminding us that even our least preferred to-do is a choice and we can choose to enter into it with gratitude and peace. It targets a common self-defeating thought pattern that most of us experience. And I’ll speak for myself here, but I never really challenged my “I need to…” thoughts before last week because I had mislabeled them as purposeful and motivating. Motivating in a pushy, non-compassionate, fun-squasher kind of way, but motivating nonetheless. It’s easy to implement. 1 word swap? Swap it like it’s hot. It’s effective. As someone who loves to gather cognitive tips and tries most that I encounter, I’m surprisingly skeptical. We’re creatures of habit, and we love our current habits so much that we don’t readily avail ourselves to the formation of new ones. Most strategies I try on for size don’t live to see the light of an hour let alone a day, and it’s rare that I find a gem that holds on tight for a week. This one has held on tight and actually strengthened over the course of the last several days. By reminding myself that I want to do whatever it is I’m doing, I’m finding enjoyment in the tasks that I habitually rushed through in the past. Hellooo, mindfulness. And what happens when we find enjoyment in the present moment? We feel happier. Because rather than waging a war on our reality, we’re accepting it in its natural state. Despite the greatest hopes of my early 20’s, there isn’t a magic, fix-all mind-hack//lifestyle choice//self-help book//haircut//career//diet//paycheck//achievement that will open the door to a state of unwavering bliss. Nope. And I’m so glad there isn’t. 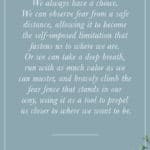 Instead, the best any of us can do is collect what serves us, release what doesn’t, and be brave enough to differentiate between the two. 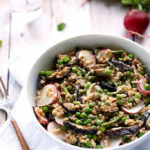 Alright, from psychology to ————–> SALAD! I’ll keep it brief: this is a goodie. 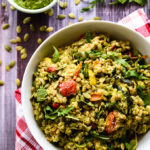 It’s simple, filling, and all-around scrumptious. Yes, I just used the word scrumptious. 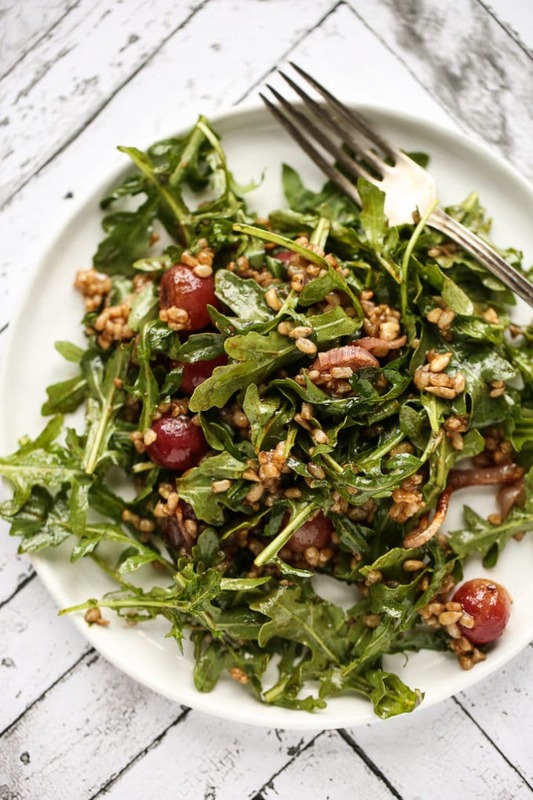 Roasted red grapes and shallots are tossed with warm brown rice, fresh arugula, and crunchy sunflower seeds. 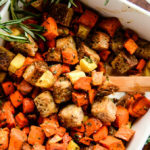 Then, all of that goodness is tossed in a speedy balsamic-thyme vinaigrette. You can leave the thyme out if you’re not feeling it, but it adds a lovely herbaceous pop. 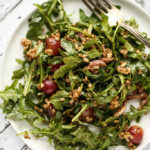 Sweet and juicy roasted grapes, nutty brown rice, toasted sunflower seeds, and peppery arugula are tossed in a tangy, thyme-infused balsamic vinaigrette. 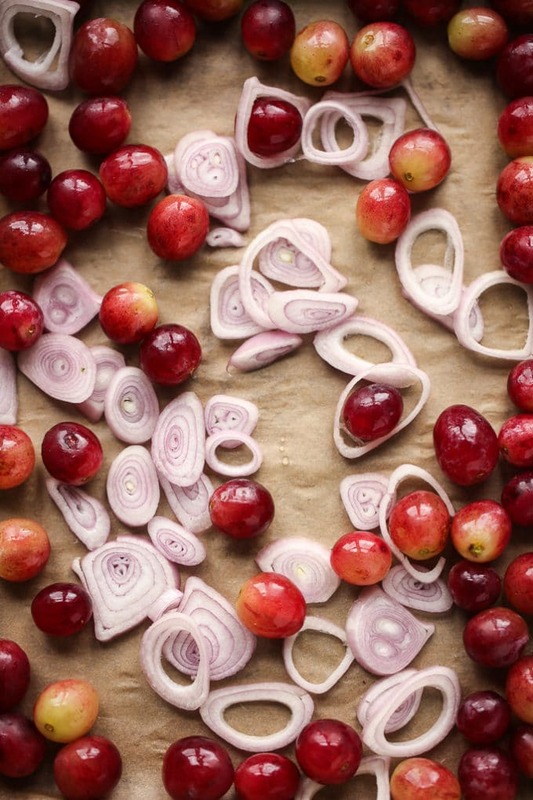 The result is a salad that's hearty, filling, and incredibly satisfying. Preheat oven to 400F. Line a small baking tray with parchment paper. 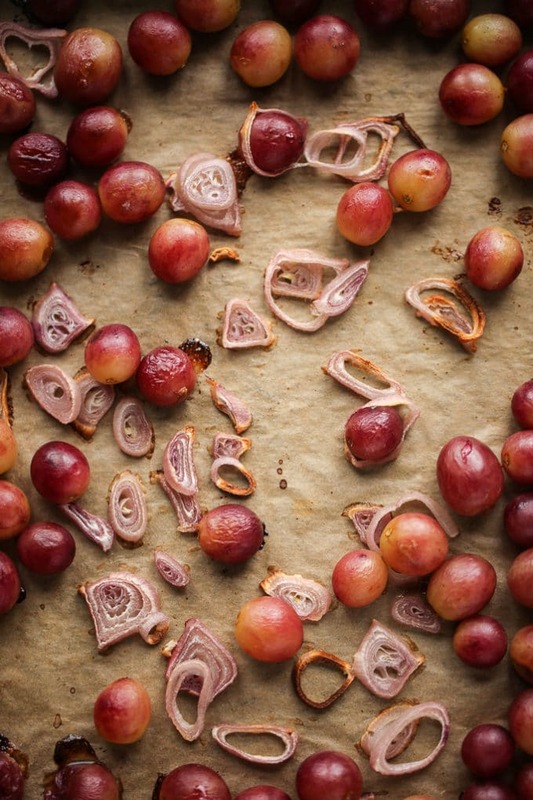 Spread the grapes and shallots out over the lined baking tray. 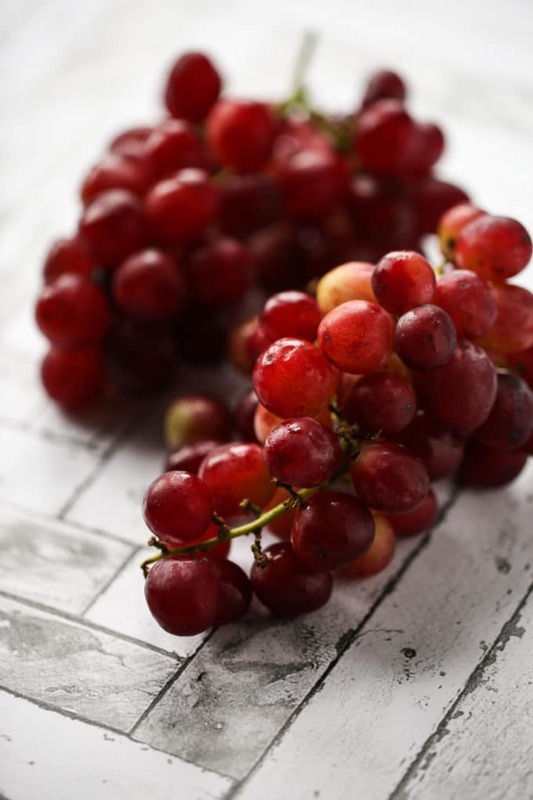 Bake for 25 minutes or until the grapes are just barely beginning to wrinkle and the shallots have softened and turned golden, stirring about halfway through baking. Let cool slightly. They'll continue to wrinkle and soften as they cool. 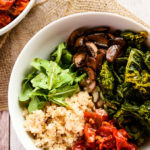 Meanwhile, make the balsamic-thyme vinaigrette by vigorously whisking together the olive oil, balsamic vinegar, garlic, thyme leaves (if using), sea salt, and black pepper until emulsified. 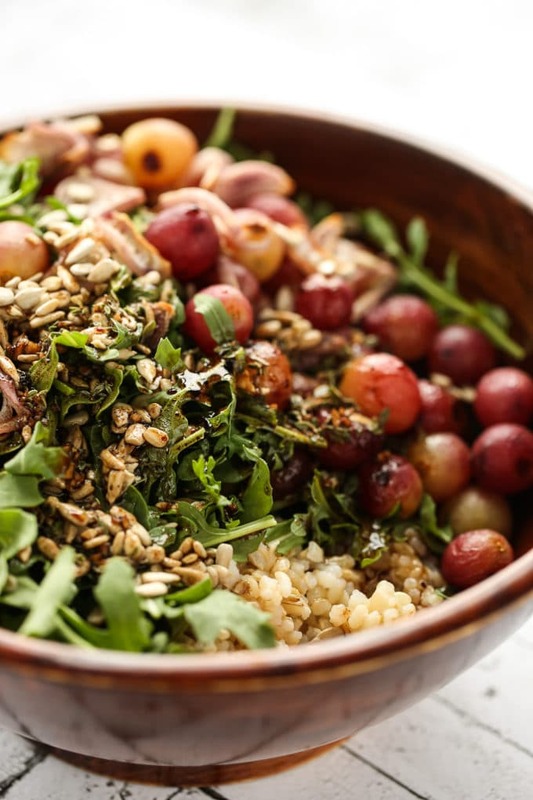 Add the grapes, shallots, arugula, brown rice, and sunflower seeds to a large serving bowl. 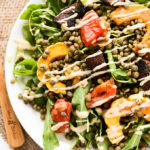 Pour the dressing over the salad and toss to coat. Serve immediately. 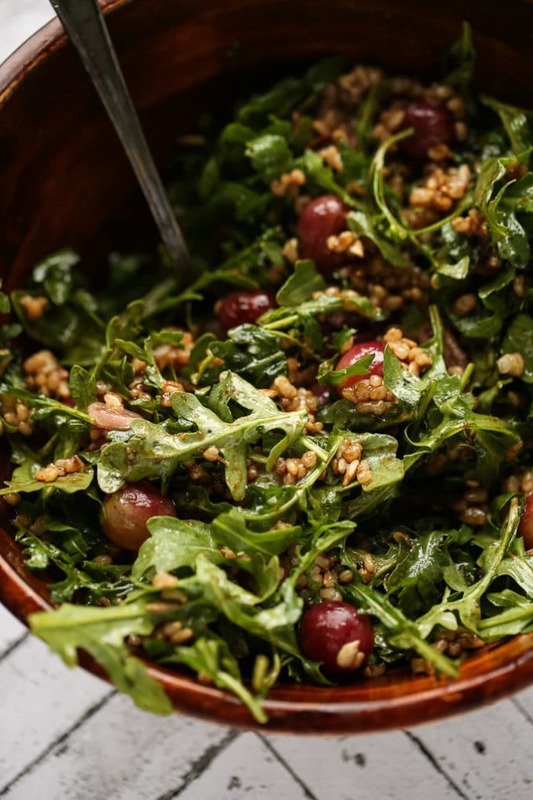 *If you're preparing this salad ahead of time, simply hold off on adding the arugula until you're ready to serve it. I feel this like WHOA lately! With wedding planning, trying to work ahead on blogging and just everything else (why does laundry need to be done EVERY week?! ), I fall into the ‘I need to’ trap almost everyday. Sometimes, it just takes changing that mindset to frame things a little differently :) On another note, this salad is calling to me! I have almost everything to make this, so I’m on it! Enjoy that Chicago sweet spot weather, we are having the same up here in Milwaukee! Ahh! Somehow I’m just now seeing your comment, Abby! Seems like I’ve missed a bunch lately, and I’m so sorry for the delay! I can completely empathize with the wedding planning madness; it’s a craziness unlike any other. Managing logistics, vendors, meal details, other people’s expectations, etc. It’s so much on its own, let alone adding a whole host of other responsibilities (laundry included — seriously, I wish I could find self-cleaning clothes). I’m glad that you find the perspective shift from “I need to” to “I want to” helpful as well. It’s been immensely helpful in my life over the last month or so and brings a little bit of peace to the craziness. 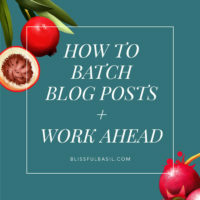 Good luck with wedding planning and working ahead on your blog! You’re so incredibly talented, Abby! Isn’t The Lively Show great? I love the balance of inspiration/dream big and practical life hacks. I hope you’re channeling your “I want to” and finding it helpful. I’m STILL using it now (over a month later), which says a lot for me. I’m normally a strategy hopper! I love everything about this post. THANK YOU!!! 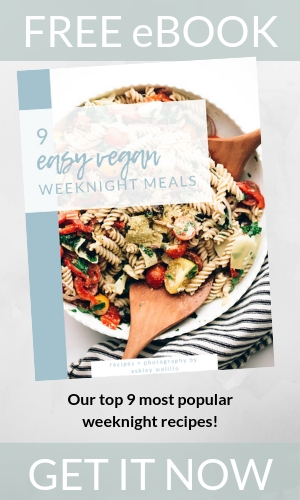 I will be sharing for food and non-food reasons! Thank YOU, Angie! I’m so glad you’re enjoying it. Often it’s the tiniest shifts that make the biggest difference, isn’t it? 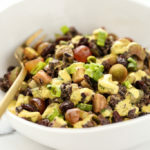 I made this for a pot luck and it is a crowd pleaser! Thanks! I’ve made this SO many times, thought I should properly rate it! So glad you’re enjoying it, Angie! And thank you for taking time out of your day to sharing your rating—means so much.